Tux Rider World Challenge is an iPhone and iPod Touch game based on the famous Open Source Tux Racer™. For the people who don't know yet this legendary game I made a Mac Intel build of the original version wich can be freely downloaded here. 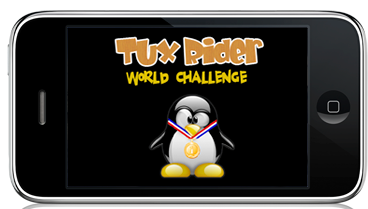 Play Tux Rider World Challenge and win prizes ! Until the end of December 2009, Tux Racer World Challenge organizes his first World Challenge, with a lots of prizes to win, thanks to our partners (Pairs of skis, snowboards, googles, t-shirts, etc...). Drive Tux (the pinguin) into the differents slopes and try to get down as fast as possible, catching as many fishes as possible. Compare your best results with your friends, people of your country or all around the world ! Works on both iPhone and iPod Touch since they have the firmware 2.0 installed at least. A real Tutorial, really easy which explains step by step how to play. Control Tux with the iPhone's accelerometers and multi touch. Make 8 differents funny tricks in the air by shaking the iPhone and playing with multi touch. 13 differents slopes, one Ski-Jump, and one Half-Pipe. Two differents view modes : at the first person (Tux's eyes), wich gives really good speed sensations but is harder to control, and at the third person (easier to control). Two differents game modes : a time trial mode where the goal is to get down the slope as fast as possible, and a classic mode where going fast is important, but eating fishes as well ! Add friends to compare your scores to their scores. How can you sell an Open Source software? Tux Rider is an Open Source software that complies to the GPLv2. Hence the source code is made available to all clients. Yet, the GPLv2 doesn't says that the author cannot be rewarded for his work. In fact, there is a widely spread misunderstanding that says that Open Source equals free of charge. “Free software is a matter of liberty, not price. How much will an upgrade cost? Upgrade to any version will be free of charge. Tux Rider World Challenge is an Open Source game released under the GPLv2 license. Hence source code is made available, and you can freely download it below.